I hope you all are enjoying this fun holiday season that is upon us. To help alleviate some stress that we can experience with this gift giving holiday season, I have put together my favorite holiday gift ideas. Majority of what you will see below I use on a daily basis, and would be a great healthy gift idea for friends and family. The essential oil roll on sticks I CANNOT LIVE WITHOUT! I have 2 in my car at all times. With the new year right around the corner and many of us about to create, at least one, health related New Year's resolution, why not give the gift of health this year to someone you love. P.S. Almost everything is from Amazon...I know what a shocker. Each one has a specific essential oil combination to help open up each one of your energy chakras. And like I said above, I literally cannot live without these guys. Rub them on the inside of your wrist, behind your ear lobe or simply sniff them in your car, during a stressful situation, or simply just to give yourself a soothing and relaxing 5 minutes and maybe even a little meditation. Give the gift that keeps on giving, with a 1 year subscription to Thrive Market. 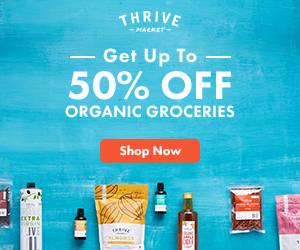 Thrive Market sells all the top organic and healthy products at wholesale prices (25-50% off), and ships straight to your door! Thrive Market cuts out all the middlemen and works directly with the brands and then they pass all the savings onto their members! Members get everyday wholesale pricing at 25-50% off the best healthy and organic premium products for just $60/year. And even better, for every paid membership, Thrive Market donates a membership to a low-income family, veteran or teacher—so together we are all making healthy living affordable for everyone. This is a company I’m honored to support this holiday season! This is a total dupe for the over priced, and over hyped S'well or Hydro Flask water bottles you may have been seeing around lately. While the concept is completely genius, there is no need to pay over $40 for a water bottle. In comes the Mira stainless steel water bottles! These little gems do the exact same thing, but at half the price, AND they even come in the same fun colors and prints those other guys do. I will admit I was skeptical at first when I first purchased this bad boy, but I was very very pleasantly surprised by performance. A perfect gift that is both fashionable and healthFUL all in one. For the friend or loved one with the green thumb! These little herb and microgreen kits are perfect to start an herb garden right in the kitchen. Herbs and microgreens are a great way to add flavor and nutrients to any meal, plus they are also a fun project for the whole family to be a part of. My top reads from 2017! This skincare line is simply amazing. After I finally healed my skin from the chronic cystic acne I had for 4 years (Podcast episode 003) I found this product and fell in love right away. every single product has ingredients that I recognize and feel confident putting on my skin. Plus they all small absolutely divine!